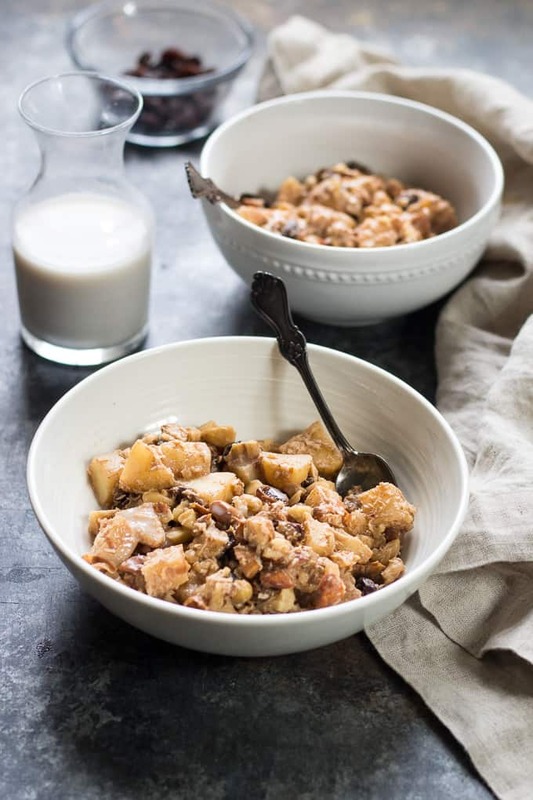 This easy Apple Cinnamon Paleo Hot Cereal is ready in just 10 minutes, free of added sugar, Paleo, and vegan. Just as delicious for an afternoon snack as it is for breakfast! I’m sneaking in a recipe today! On a Thursday – yes – this is the day I typically ramble on about thoughts and life, but, I thought you might want to get in on this preeeetty spectacular Paleo breakfast recipe. A breakfast recipe, that – oh yes my friends – is SWEET and contains no eggs. Sometimes I just don’t want eggs. Or kale. Or meat. I guess I’ve also been having a whole lot of CLEAN FUN with my apples lately, and had to see what else I could do. Don’t you guys love the cinnamon apple combination? Heck yes, for me. 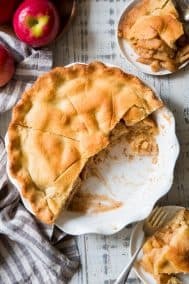 I also find that cooked apples are so much more pleasant on my digestion, and I’m always happy to find new ways to cook them. 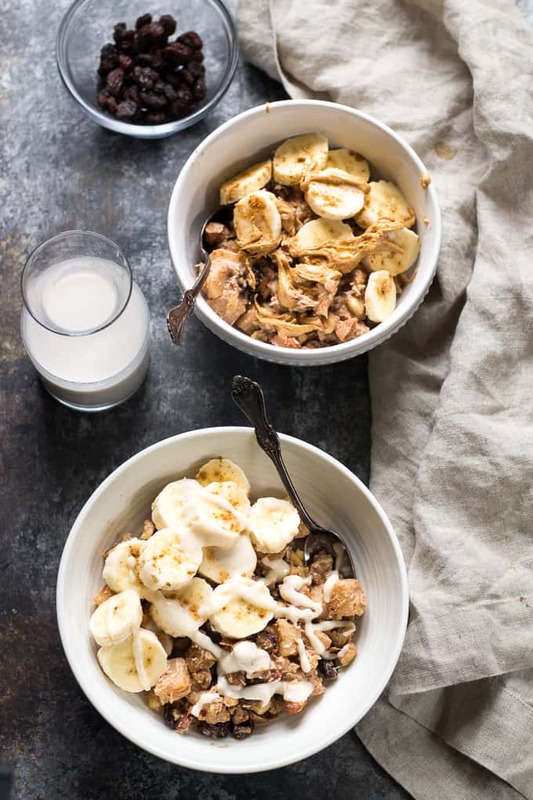 The thing about this yummy Paleo hot cereal is that you have options! Let me explain. First, timing options. 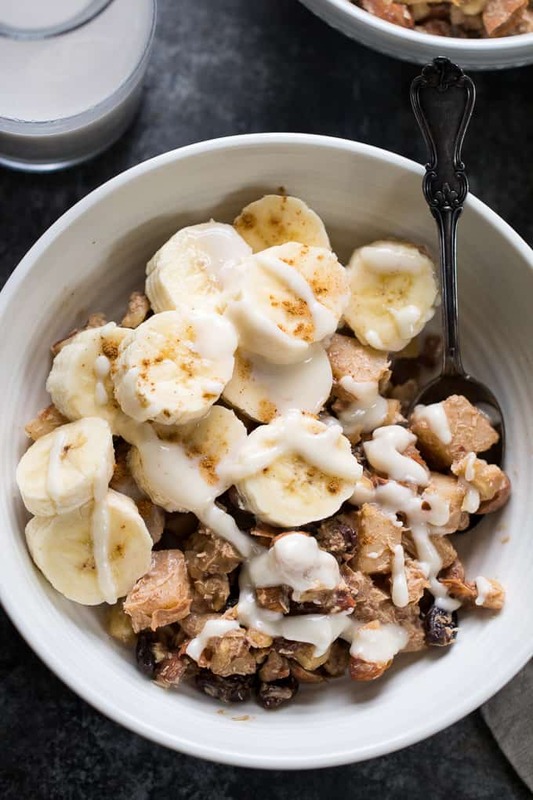 If you have NO TIME in the morning – whatsoever – you can make the entire thing the night before – minus toppings -and simply top with a bit of almond milk, heat, top and eat. Super simple. The first time I made this I went with sliced bananas and coconut butter for me, almond butter for Adam. The second time, I added bananas and nothing else and it was perfect. Add whatever suits your mood, or add nothing at all, up to you! I actually just had this for lunch because I’m rushing to get work done before picking up the kids, and I had leftovers in the fridge! I love that it’s sugar-free (so not quite a baked-good) but still has some sweetness to it, along with healthy fats. I hope you’re ready to start – let’s go! How often do you crave a sweet breakfast? How much time do you have in the morning to get breakfast ready for yourself? This looks amazing! I especially love the fact that it’s really chunky..I hate when oatmeal is super thin like soup. Thanks for sharing! Do you find that cooked fruit and cooked veggies are better on your digestion? I think I’m finding that too, but I can handle some raw veggies and fruits. And this looks EPIC. Chunky is my favorite. 100% easier to digest for me, I don’t eat raw veggies besides salad greens and cherry tomatoes really, and with fruit I’m okay with raw berries and bananas but everything else I try to cook. Hi there! This was a complete hit for my boyfriend and I on my first day of Whole 30. What do you guess the calorie count would be for one serving? Thanks!!! Ahhh! Did you hear my happy scream thousands of kilometers away? haha After 6 days of whole30 egg casserole this is EXACTLY what I need. I will have to adjust a little because nuts used to give me major tummy aches but will try to include a little amount at first and see how it goes. Thanks for sharing, perfect timing! I was told that Almond milk Whole30 compliant??? That’s what the Whole30 book says too. Oops, i was told almond milk is NOT Whole30 cpmpliant??? Michelle, what is the whole 30 that you keep referring to? Can’t wait to try this! I’m doing the January Whole30 too so something different for breakfast is so great! Hi Michele! Love your recipes!! I am not paleo or whole30 but eat very healthy and love a lot of those recipes. This I am gonna make for sure! But, am not a fan of raisins and not sure if I want dates in it either. Think if I leave them out it’ll change the texture or flavor? Thanks! I’m going to try it with dried cranberries instead! 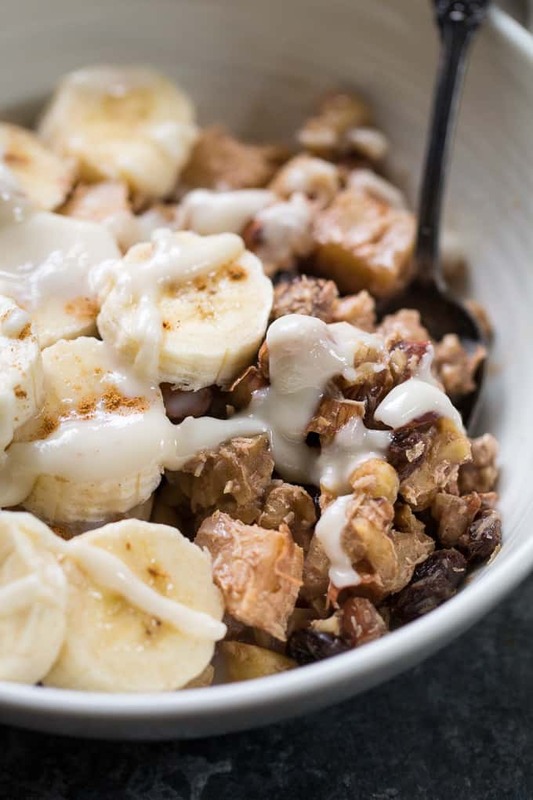 As an oatmeal junkie, I could never imagine eating eggs everyday for breakfast on the Whole30, so this recipe gives me hope that I can last all 30 days! Ate this for breakfast yesterday and it was deelish! Thanks so much for the recipe! So delicious! My kids loved it too. thank you for the great recipes! I put hemp seeds on top. I agree with you that coconut butter makes everything delicious! Ooh that sounds so good! Glad you guys liked it! Almond milk is NOT Whole30 compliant??? At least that’s what I was told and the book says. Just made this for breakfast because I was NEEDING something new for breakfast – so filling and SO delicious! Excited to have leftovers for tomorrow’s breakfast 🙂 your recipes are making Whole30 so much easier! Thank you! That’s awesome, so thrilled to hear it Rachel!! Same question as above…what is that delicious looking drizzle? It’s melted coconut butter, so yummy! On Day 7 of my second whole30 and my boyfriend’s first. 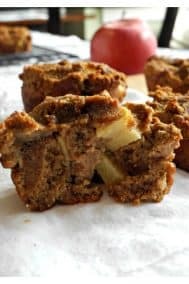 I was scrolling through pinterest looking for whole30 breakfast recipes because we were looking for something without eggs. We are already so burnt out on eggs!!! My boyfriend looked over and saw the picture and demanded it for dessert. We split one serving and didn’t even finish it, it was so rich, delicious, and filling! We are saving our leftoers to accompany breakfast in the morning, and we will definitely make this recipe again and again! Omg… That was amazing!!! I used pears since I was out of apples and they worked well. I started the #whole30 aboutt a week ago. Was craving my oatmeal lately. This was sooo much better than oatmeal. Thank you! Used banana and blueberries for topping. Yum! 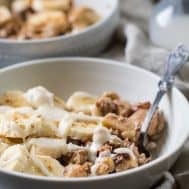 any thoughts on making this with cashew milk instead of almond milk? Have you ever frozen this? I’m making a big batch and was wondering how t would be frozen and thawed later? Love this recipe! I use half regular almond milk and half unsweetened chocolate and add pumpkin spice seasoning. I haven’t frozen it so I’m not sure what to expect with the reheating! I would think it would turn out fine since you’re not really looking for crunch anyway, and can always reheat a bit longer if there’s too much liquid. Glad you like it! Hi Michele! I’m currently on my first Whole 30 journey and I can’t wait to try this recipe! What is the sauce on top? It looks far too thick to be regular almond milk. Thanks! This really opened my mind to new ways to look at breakfast. This was so yummy! Thanks for sharing such an awesome healthy recipe! I like to make bigger batches of meals ahead and then eat throughout the week (I only cook for myself). How long do you think this would keep? I assume the apples would be the only thing that might begin to go bad. I made this this morning and it was awesome! I topped it with banana and some heated up natural peanut butter. I can’t wait to eat it again. And it was super filling! Hi! This looks delicious and I just attempted it but it still looks pretty…liquidy – unlike your picture. Unsure of what went wrong! Is it suppose to have that milk consistency? Yours looks dry with a drizzle on it. Sounds like cooking a bit longer, or on a higher heat setting to let more liquid boil off would do the trick. You can always add more at the end if it gets too dry. Don’t you think the number of calories is high for one serving? I usually keep my calories for breakfast under 250. This just seems high. You can keep it lower by having a smaller serving, it’s very nutrient dense due to the nuts and coconut. While this looks yummy, it is not Whole30. This confuses so many people new to Whole3! I agree 1000%. 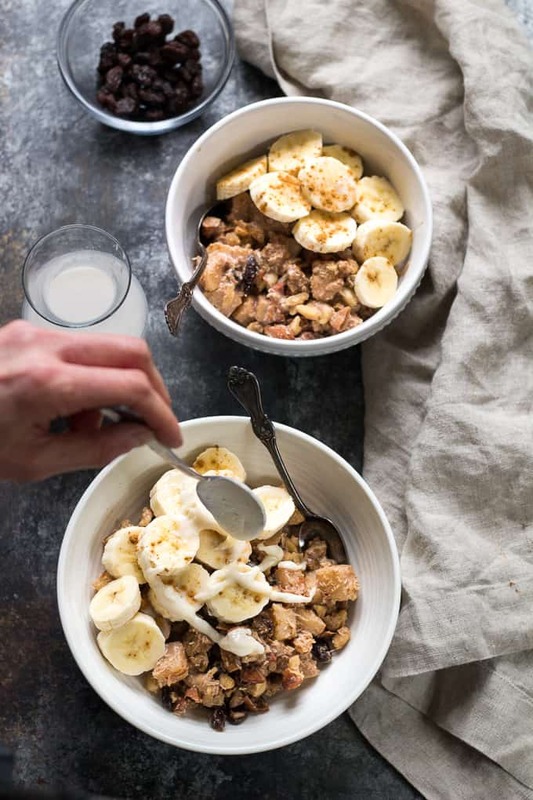 Recreating cereals & sweet breakfast bowls isn’t compliant, and definitely not in the spirit of the program. Recipes like these tagged as Whole30 are so confusing to new folks. 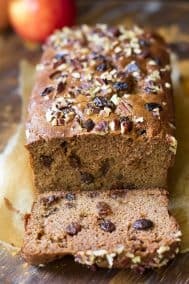 Have you tried this with dried figs instead of dates or raisins? I have some and might give it a go! This was very tasty & satisfied my oatmeal craving. However, even though I let this simmer for 10min it was still too watery for me. I’ll definitely make again if I figure out how to thicken it. I’ve been trying out new breakfast recipes the past couple of weeks and I have to say, this was one of, if not the best so far! I made it the night before and heated it at a lower wattage in the microwave in the morning so it wouldn’t burn. It smelled so amazing that I only topped it with banana and more milk to start, but I think next time I’ll try the new chestnut spread I just bought. Because I will definitely be making this again! This is delicious! I had to cook the apples and nuts longer because when they are at a “raw” state, I get a huge stomach ache. I don’t like raisins or dates so I omitted them both. Still delicious!! And I topped it with melted coconut butter! AMAZING! Thanks so much!!!! I am a vegan and diabetic….trying to eat the whole 30 program, so thrilled to find an egg less breakfast……can’t wait to try this today!!!! My mouth is watering as I type this!!!!! And under my calorie count too!!!! Rock on!!!! So yummy! And so good with the banana!! Great recipe, you are making my Whole30 delicious! Oh that makes me so happy to hear! I make this all the time. It is absolutely my favorite breakfast. I make it for guests and they rave over it too! This recipe looks amazing! I have so many apples on my trees to use up. Do you think I could can this? That was… absolutely YUM! So what I needed on Day 11 of my Whole30. Love the variety of flavor and texture. Thanks for this! Thanks for the recipe! We really enjoyed it and it was the only whole 30/paleo breakfast porridge that wasn’t gummy or gooey. I would suggest putting the ingredients in order to standardize the recipe and make it easier to read. I’m doing the Whole30 and missing my morning oatmeal. This was so yummy I may never go back to oatmeal. 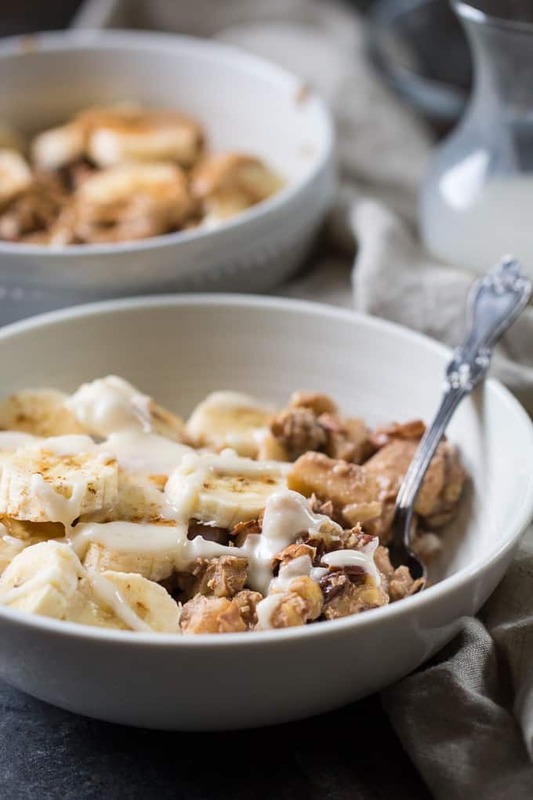 I used coursely ground walnuts and cashews while made a creamy like texture, and topped with I/2 sliced bananas and a sprinkle of sliced almonds. This warm breakfast is delicious!!! I often miss oatmeal since my allergy, but this more then replaces it. I live to make a weeks worth and store in the refrigerator like over night oats for an easy on the go breakfast! What a great change away from eggs! This is a nice warm, sweet breakfast. I did wonder when you add the cinnimon and nutmeg? I was following the recipe and didn’t see it, so I just added it at the end.